We love it when our Pastry Chef Laurel Melchor shares her favorite recipes with us! 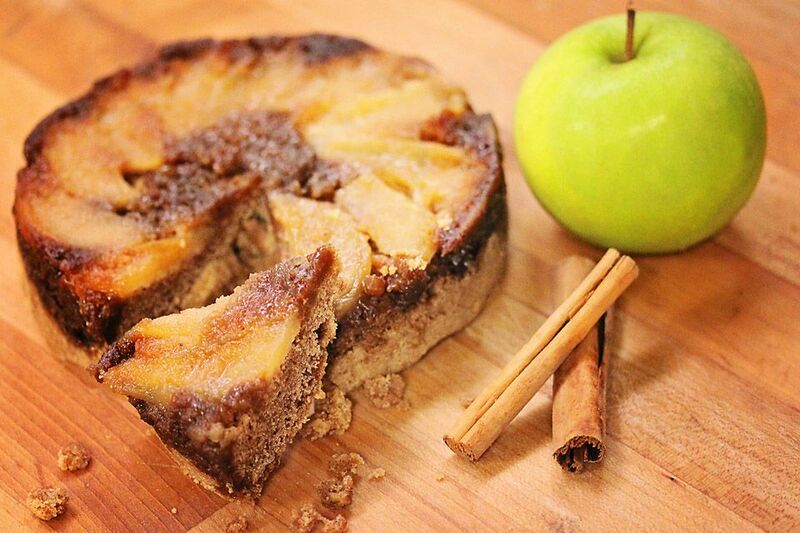 Combining cinnamon, apples and brown sugar, this is the ultimate fall dessert. We prefer to enjoy it as an afternoon treat with a cup of tea, but it could also be served in the morning at brunch or in the evenings after dinner! In the bowl of a stand mixer fitted with the paddle attachment, cream the butter and sugar until light and fluffy, about 3 minutes. Add the eggs one at a time, mixing well after each addition. Scrape down the bowl very well. Add the dry ingredients and mix slowly just to combine. The batter will be very thick and sticky looking. Set aside. Pour the 2 ounces of melted butter into a 9” cake pan. Tilt the pan so the butter coats the sides and bottom completely. Sprinkle the brown sugar evenly over the bottom of pan. Arrange apple slices in an even layer over the brown sugar. Pour the cake batter gently over the apples, spreading it carefully so as not to disturb the layer of apples. Bake at 350°F 35-40 minutes. A toothpick inserted in the center of the cake should come out clean. Allow cake to cool to room temperature. Run a thin knife around the edges of the pan, place a large plate on top of the pan and quickly invert the cake onto the plate. Tap the top a couple of time to encourage the cake to release its hold on the pan. Gently remove the pan. If a few apples cling to the pan, lift them back into place on top of the cake. This cake can be cut and served immediately, but it actually increases in flavor and is even more delicious the next day.